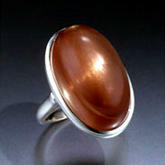 Cabochon or cabouchon is a gemstone, which has been shaped and polished as opposed to faceted. The resulting form is usually a convex top with a flat back, although the term is used to mean any deliberate shape that is not faceted. 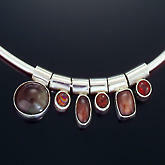 Cutting "en cabochon" is usually applied to opaque gems, while faceting is usually applied to transparent stones. 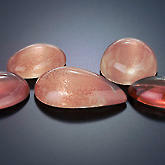 The usual shape for cutting cabochons is a rounded oval. This is at least partly because the eye is less sensitive to small asymmetricalities in an oval, as opposed to round shape, and because the rounded cross section fits well with the domed top. 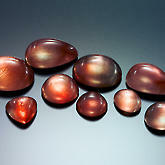 Desert Sun Mining & Gems brings you the worlds most dramatic colors of cabochons. 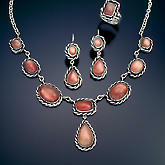 Colors that will enchant, mesmerize, and bedazzle your senses. Colors so extraordinary that they will take your breath away. A dazzling palate paints our latest collection.